Over the past week I've gone off on a bit of a music tangent on Instagram through instastories. The whole thing started with me admitting a bit of a guilty pleasure - mainly that I'm THAT girl in the car who's rocking and bobbing and singing music at the top of her lungs while she drives. Not to worry, folks, no accidents have been had in the process of pretending to be Mariah Carey. Thank God. It's just pure heaven and enjoyment in an enclosed space. Since the cat is out of the bag, I thought I'd follow up with some of my favourite tunes to shake and grove to while in motion. And that's how we find ourselves here today, with a playlist that will be updated on a weekly basis. 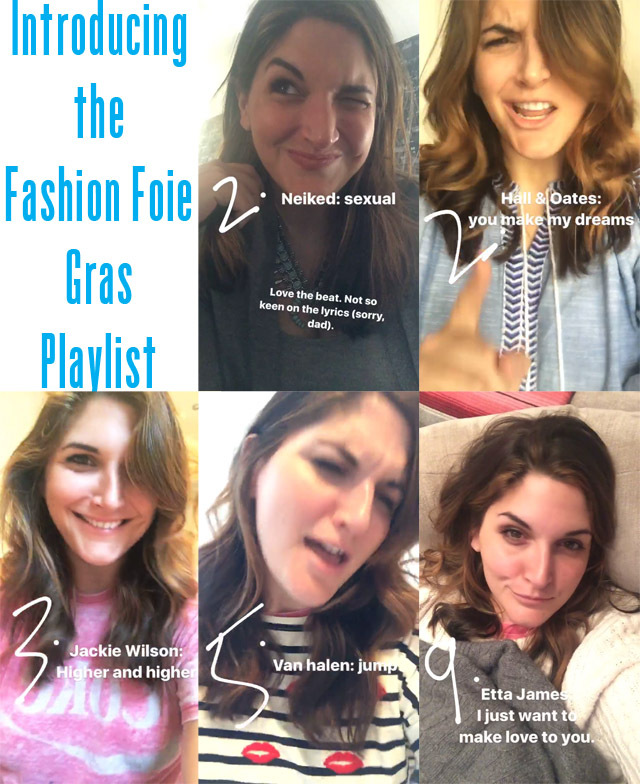 Thinking on this, I do believe it might just be the most personal share I've done yet on Fashion Foie Gras. Music is my second love behind sartorial pursuits. I have long been obsessed with the way music can completely turn around any situation, and also it's ability to dramatize a moment in time. Back when I was at University, I used to burn CD mixes for all of my girlfriends and slide them under their doors late at night. Our last night in the dorms, before we were to head out into the real world the next day, I prepared a "goodbye mix" for everyone to listen to as they drove out of our bubble and into the big bad world. I don't think I've ever cried harder in my life, leaving a place and friends that had become so familiar over the past four years only to enter, what seemed at the time, a crazy unpredictable and scary universe. But, that was back in the days before MP3 players, iPhones or anything as insane as iTunes and Spotify. Not that I'm complaining at all. Each situation comes with its own set of plus points. But, it's 2017 now and I'm embracing the power of Spotify, specifically, and creating the ultimate mix for anyone that wants an in on this happy train. If you already follow me on Instagram, you'll know that I'm introducing the new songs I'll add every week in a way that showcases me as an absolute freak of nature with a mock microphone. Hey, I can't help myself. I'm pretty unstable. If you aren't following me on Instagram, and have no interest in changing that, not to worry as you'll still get access to the music here, just sadly without the goofball, that's me, attached. Every week the list will be updated, on Mondays and Fridays. Mondays will be a complete surprise and Fridays will always be all about the Friday Feel Good Feeling. Buckle your seatbelts, people, as this is going to be a rip roaring ride! For now, head over to Spotify to follow the playlist so you never miss an update!